Since that day, three new judges have been nominated to the Third Circuit, all three by President Trump, two confirmed and one pending. All three: men. Last week, Judge Thomas Vanaskie took senior status, creating a fourth opening for President Trump to fill, less than halfway through his term. (President Obama added five during his two terms, one of them Vanaskie.) 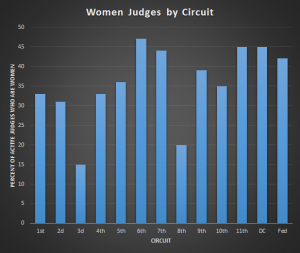 Among other things, this means that the number of active Third Circuit judges named Thomas is no longer greater than the number of them who are women, which is progress of a sort. Once Paul Matey is confirmed, the Third Circuit’s active judges will be 11 men and 2 women. A court that just a decade ago featured a robust, ideologically diverse contingent of women active judges—Sloviter, Roth, Rendell, Barry—will be more gender-skewed than a Black Sabbath show. Some conservatives still dismiss any attention to the diversity of federal judicial nominations as a “quota mentality.” I disagree. I believe the executive branch does real and lasting damage to the judicial branch when it creates wild demographic distortions like the gender imbalance now afflicting the Third Circuit. No excuses: the person nominated to fill Judge Vanaskie’s seat has to be a woman. But, let’s face it, if the only voices who speak up about this now—before a nominee is named—are nerdy, liberal-leaning circuit bloggers, the odds aren’t great. So I hope in the days ahead that people the administration will listen to speak up, publicly or privately. Those of us who care about the Third Circuit and the federal judiciary as a whole have a duty to protect it. Now, I submit, is one of those moments. The Third Circuit’s next nominee should be a woman. The Trump administration needs to hear that now. This entry was posted in Judges on December 3, 2018 by Matthew Stiegler.